Stephen Coonts is the author of 15 New York Times bestsellers, the first of which was the classic flying tale, Flight of the Intruder. Born in 1946, Stephen Paul Coonts grew up in Buckhannon, West Virginia, a coal-mining town of 6,000 population on the western slope of the Appalachian mountains. He majored in political science at West Virginia University, graduating in 1968 with an A.B. degree. Upon graduation he was commissioned an Ensign in the U.S. Navy and began flight training in Pensacola, Florida. Mr. Coonts was a trustee of West Virginia Wesleyan College from 1990-1998. He was inducted into the West Virginia University Academy of Distinguished Alumni in 1992. The U.S. Naval Institute honored him with its Author of the Year Award for the year 1986 for his novel, Flight of the Intruder. Steve resides in Colorado. Thank you for your excellent books. Just reading though the Fortunes of War and am curious what Clay Lacy did to really piss you off. I’ll never forget 1986 when Chuck Yeager was at Mr. Lacys hanger in Van Nuys shooting a Pepsi commercial when he told Joe Casperoff, the owner of the P-51 that he (Mr. Yeagar) was going to take it around the patch once. Joe said F U to Mr. Yeagar and had Mark take the P-51 back to the hanger. Just finished reading your books of Flight of the Intruder and The Intruders. I am on the third book of Final Flight. I love your writing. Jack Grafton is such a beliverable hero. Your books make me more respect our men and women in service. Their dedication and sacrifice are the reason that we can live the way we want to live. Thanks. I was totally unaware of Mr. Lacy, a prominent aviation businessman, when I grabbed that name out of thin air for the tale, FORTUNES OF WAR. My apologies to Mr Lacy if I have caused him any grief. Steve, could you be so kind to remember what kind of feelings did you have while fly A-6 from the carriers – that you are combat ready Naval Offcer being temporary in the air or that you are the air-minded flier being temporary in Naval uniform? I was also stationed at Whidbey in 1969 attached to VAH-10 flying A-3 Skywarriors. Small world. Could have seen each other many times. That’s why I just love “Flight of the Intruder”. One of the best (if not THE best) attack aircraft ever built. Love all of your books. I have read about 10 so far. The Deep Black series are my favorites. Thank you so much. I never thought I would get so hooked on an author since I finished reading John Grisham but you have replaced him as my number 1. Thanks again Mr. Coonts. I enjoy and have enjoyed all of your books. I am now reading some for the second time. I really like Tommy. Greatly enjoyed Flight of the Intruder when I read it many years ago. 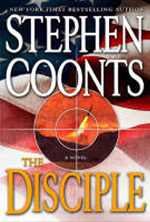 Just finished The Disciple and thoroughly enjoyed that one, too. Keep up the good work! Visited your website and the Dear Creek Farms vids on rifles and arrowheads; what a trip you life has been!….. I enjoyed flt of the intruder as my little brother flew A6s off the Ranger with VF 145 “Swordsmen” I proceeded him to vietnam as a Army helicopter gunship pilot. We were ahead when I left. I flew aerobatics for 25 years in Pitts S1-S2A S2B and finished up with Extra 300. I have been flying Huskys since. I have a 1996 A1 and a 2002 A1B. I am now in the process of buying a used Stemme S10VT to keep away from medical grounding.I just read your article in the March 2002 AOPA magazine and wondered if you were ever able to buy a Stemme. I’ll be picking it up in Arizona 5 June then flying up to my home in Seattle along with an instructor Glider Bob from Colorado. If your going to be in town LasVegas I’ll give you a call when we come by if your in the phone book. I also enjoy shooting and collecting guns. Stay healthy and safe. Love your first three books on Jack Grafton Series. Not so with book Hong Kong. Those Chinese revolutionaries in this book are terrorists in my eyes. I sincerely hope that China will truly embrace democracy one day with peaceful approach, not with violent revolutions. Just afer reading Wages of Sin…. I’m a huge fan Can’t wait to read the rest of your books. All the characters were wonderful! Tommy Carmelli is better than James Bond! Well done! I read your first book,Flight of the Intruder, not long after it was published and thought it was a good read. Then, for some unknown reason, I failed to pick up another of your books until just last week. I was lucky enough to buy a second hand copy of Fortunes of War in a local charity bookshop, what a great read. Luckily there is now the ‘Internet’ and I will be absolutely, positively seeking out more of your books in some catch up kind of way. Thank you for the writing and more strength to your writing elbow. Thanks for the recommendation, I couldn’t have done it without you. I have enjoyed every one of your books that I’ve picked up. My father is a retired USAF Fighter/Bomber pilot and was not very good at relaying what it felt like to fly those jets, so hearing your excellent recollections clued me into why my Dad must have loved his craft. I work for the US Navy fixing ships and will never fly (bad depth perception) but your books have given me an appreciation for what our work does for the serving men and women in the service in the way of protection. Your stories also give me additional motivation to assure we do our best for those putting their lives on the line to allow me to sit a quietly read your books in my nice house free from danger and attack. Please keep your stories coming as they are great source of entertainment for me and many others that I know. Thanks for taking the time to write Flight of Intruder and The Intruders, I absolutely love these books. These books are not only great novels but they serve in many ways as a way for future generations to understand war and service from your first hand experiences that come through in page after page. I began reading the first four of your books during my deployment to Iraq in 2005. I saw Flight of the Intruder back when I was a kid but I never got around to reading the book until I was an adult. I happened to find both Flight and The Intruders at the FOB library, I started reading and I couldn’t put them down. I had my wife send me Final Flight and Flight of the Minotaur; I read them almost as fast as I read the first two. Flight is leaps and bounds better than the movie and now that I am on my second deployment, I am reading it again. As a child, I always wanted to be a pilot but my vision kept me restricted to the ground so I entered the Army and I find myself deployed again to Iraq. The characters and their internal and external struggles I can easy relate to; your characters remind me of my friends and those that I serve with. I wish you and your family all the best and congratulations on your newest book. P.S. Please make the next book about Grafton’s time as a LCDR and a squadron CO…he made the decision to stay in, where does it take him before he becomes a CAG? Just read Deep Black, Arctic Gold. Enjoyed it! Starting on Deep Black, Conspiracy now. I’m a fly boy also, Civil Air Patrol, Black Sheep squadron, Denver, Colorado. Stephen…Just finished “Disciple”. Great stuff. Your other books, which I have also read, allowed me to get my grandaughter. eleven years old, her first flying lesson. Talk about a grin you couldn’t wipe off! Thanks again and will be looking forward to the next book. Happy New Year and thanks for The Disciple. I just finished it and am grateful for my ability to forget what I read a long time ago–so just like my periodic rereading of Patrick O’Brian’s whole Aubrey-Maturin series, I’m now going back reread the earlier Tommy Carmellini stories. Jake and Callie have been terrific, iconic characters and, as I told when I got to meet you briefly once in Colorado, Thank you for being a leader in the genre. I’ve read the Grafton series thru Hong Kong and I play the charactors from the movie in my mind as I read…. I enjoy each one…. Just finished a Deep Black book and could not put it down! Am going to start thru that series soon. I will be in Los Vegas in July with Walgreens… hope to have another one down by then… thank you for taking me away from reality for just a little while! Your Intruder books are educational and fascinating although I wish I had waited to read Final Flight until I had read all your Jake Grafton novels. I’m a writer myself and am always looking for good fiction. I was out of town and picked up Hong Kong to pass the time and couldn’t put it down. Wow – non-stop action and a fantastic story. I couldn’t find where it was made into a movie – what a missed opportunity – it would make a brilliant one. Hi Steve, Great books, very believable characters and situations in all I have read so far, (seven). Trying to keep them in proper order, pretty hard to do as new titles appear. I appreciate a good read, your material is so appropriate to past and current events. Thanks for all the great books that you have written. I served on the USS Lexington from 1968 to 1972. I’ll bet that you did all your carrier training on the Lexington in the Gulf of Mexico when you were getting your wings. I was surprised when I checked your website out to find out you were an A6 Driver which made your Flight of the Intruder so real. Keep up the good work. Enjoying another one of your books,”Saucer”,…Marc the Grounded Pilot. enjoying your quite gripping stories. Was also hoping you still live in Maryland (per some of your book jackets but not mentioned in your bio above) as I like to donate autographed books to charity auctions… if you ever drop back into the Free State, and would tolerate the intrusion, please email me where to rendezvous (If you’re crashing at Tom Clancy’s pad, I have a few of his I’d love to get signed, too!). Thanks, & keep doing your thing… Write On! I am a big fan. I have read all the Jake Grafton and Tommy Carmilini novels and I hope for more novels of both of them in the future. Thank you for the great reading. Never have I laughed so much in my life !. That doesn’t know how to spell: Coronel ?. Thank You , for: the Books , Sir !. A very big salute from Europe. Now On Sale at Your Favorite Local Bookstore or order online! Click the cover to be taken to the order page. How Do You Get Your Coonts’ Fix? Herbert Yuttal on What were they thinking?